Many of you know that I just returned from the longest vacation of my life — a full five weeks on Florida’s West Coast. 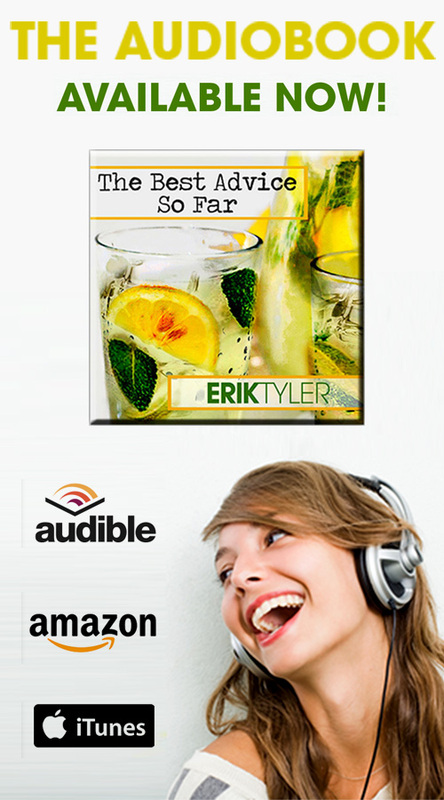 Get the audiobook up and available online. Visit Captiva and Sanibel Islands. Start writing my next book. And I’m happy to say that most of my goals were achieved, including each of the above. 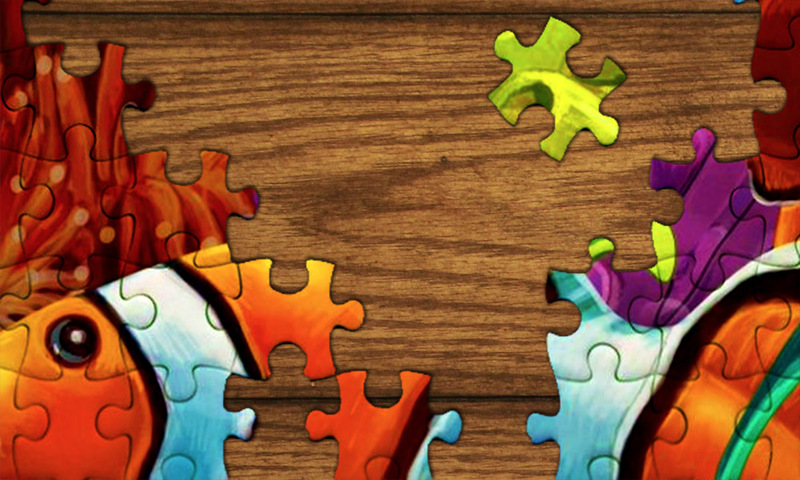 Complete a difficult jigsaw puzzle. When I was a child, and into my teen years, I always had a jigsaw puzzle going. And as far as I was concerned, the harder — the better. I did an all-black puzzle with only a tiny pinhole of light at the center. I enjoyed the square variety where the same picture from the front was displayed again on the back, only rotated 90 degrees. I did puzzles where the frame was irregular instead of having flat edges. And though finding room was a challenge, I often did puzzles of 4000 or 5000 pieces. Still, as big a part of my growing-up years as puzzles were, it struck me recently that I hadn’t done a single one since high school. As crazy as it sounds, setting into that jigsaw puzzle — whatever it would be — was cause for just as much anticipation as watching a tropical sunset. I’d been given a Barnes & Noble gift card for Christmas and had tucked it away in a special place, just the occasion. Working on the puzzle, I was transported back those three decades. I often became aware that I was biting my in-turned lips or that my tongue was poking out from the corner of my mouth as I sorted pieces, much like it had when I was 8 or 10 years old. Still, for all the fun and nostalgia, the puzzle was done by the second day. 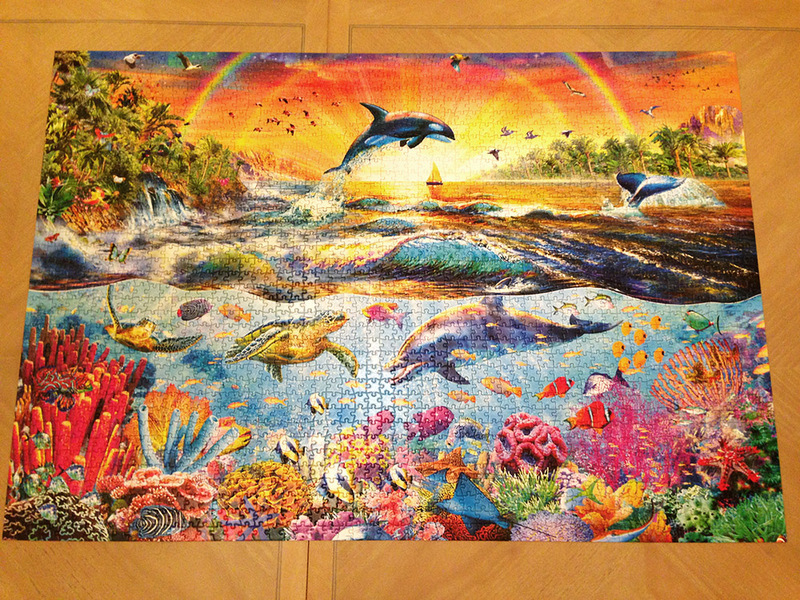 I carefully moved the completed puzzle to the heavy marble table in the living room and cracked open a 550-piece puzzle I’d found on a shelf in the vacation home: a whimsical beach scene. This, too, was done in a day. It was time to bump things up a bit. I still wanted something that felt “vacationy” (so an all-black puzzle was out), and yet I was ready for a bigger challenge. Finding the next puzzle brought with it a surprise. After seeing a special showing of the Broadway version of Disney’s Newsies at a movie theater in town, I stopped into an adjacent fabric store to ask if perhaps they knew of any toy, hobby or game stores in the area that might sell puzzles. As it turned out, they themselves sold puzzles (who knew?). 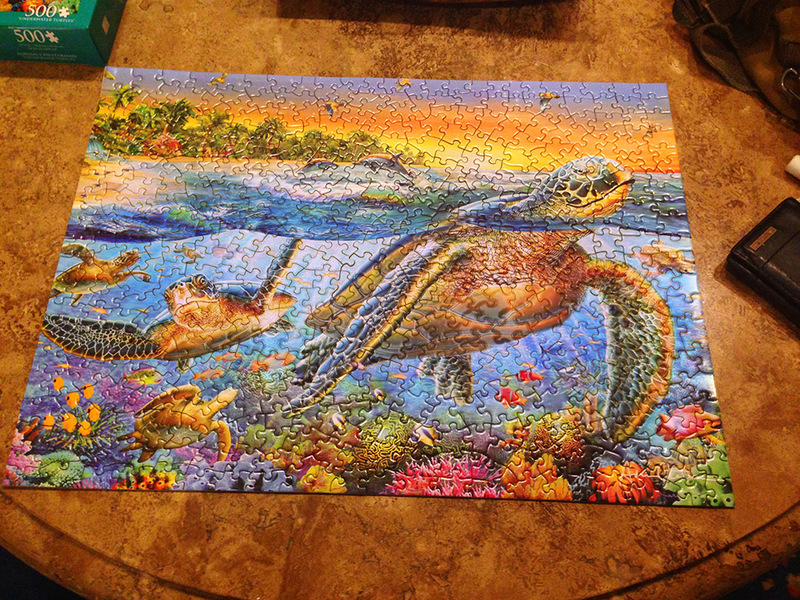 Even more unbelievable, they carried a 2000-piece puzzle by the same artist who’d created the sea turtle puzzle. It was settled: “Tropical Paradise” would be the next to hit the table. The clerk even gave me her employee discount (I’d mentioned that it was my birthday), and I got the puzzle for just $10. It’s daunting, but also exciting (at least for me). Somehow — somehow — all of those pieces are going to come together in the end. 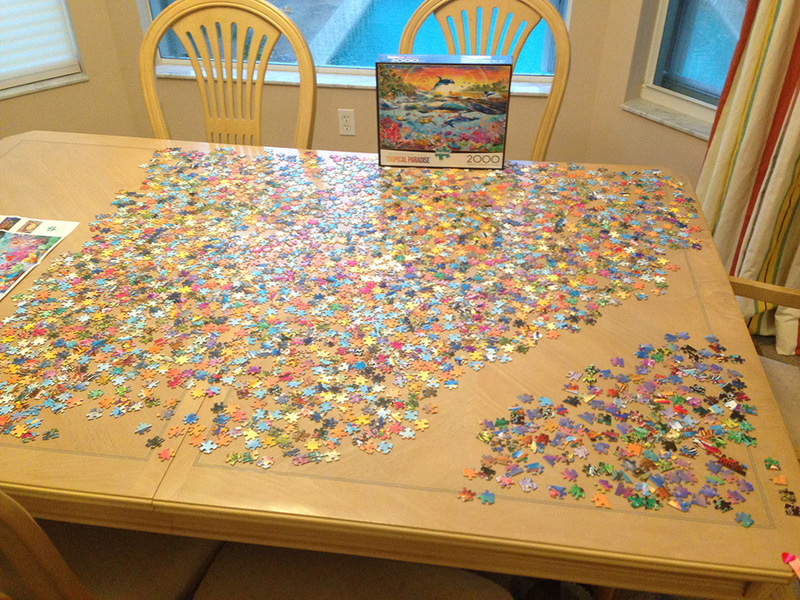 It seems to me that, once upon a time, nearly every family room hosted a jigsaw puzzle in progress. Anymore — against the current landscape of customizable, digital entertainment — puzzles, sadly, have become scarce, viewed as a quaint or archaic amusement best suited to convents or nursing homes. Yet, in reviving my childhood obsession during this recent vacation, I was reminded of a dozen or more benefits that accompany this pastime. I’ll share just a few. 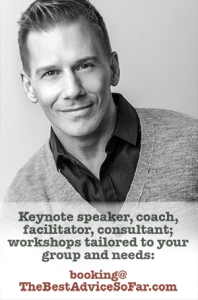 I’m a big proponent of the idea that we need to cultivate times of constructive silence and stillness into our lives. A puzzle is a natural and creative way to do this. Many people think of yoga or meditation when they think of “constructive silence.” Puzzles are just one of countless ways to include down time in your day. And if you’re careful not to fill the space with television or music, this can open pathways to new thoughts, problem solving, or conversation with puzzle partners. We live in a world where we’ve become accustomed to having things done instantly. Consequently, not only our attention spans but our tolerance levels have progressively diminished. I devote an entire chapter in The Best Advice So Far to this statement: Patience is still a virtue. If this is true, then a lack of patience would seem to constitute a character flaw. By definition, patience is the ability to graciously wait. It stands to reason, then, that if we never have to wait — we will never develop patience. Completing a puzzle takes time. Hours. Days. Even weeks, if you work at a leisurely pace. There’s no cheat sheet. It comes together one piece at a time. And yet there most definitely is a reward for that patience. As you see sections of a puzzle take form, anticipation builds. You feel a growing sense of accomplishment. And as the final piece is popped into place, there’s a sense of pride you get that just can’t be duplicated by activities that offer immediate gratification. Tenacity is different from patience. Just looking at my out-of-the-box picture above, you can well imagine that there are times when you feel something close to frustration while doing a puzzle. You’ve looked through the remaining pieces a hundred times and still can’t find that one section of the dolphin’s tail or the sponge coral. How could you be missing it? Is it lost? Has it fallen on the floor? But you push forward. You move on to another part of the landscape, trusting that it will all come together in the end. With both math and puzzles, it’s about more than solving the problem. It’s about developing the fortitude to see something through — a job, a creative venture, a marriage — even in the face of roadblocks. It’s about the willingness to stick with a challenge, to give it one more try. The red tip on the notch of that piece — is it a fin? Part of that coral? A glint of sunlight on a wave? Or this blue one with squiggles — sky and clouds? The wake of some fish? Seeing the world not only in terms of “what it is” but in terms of “what it might be” has far-reaching implications. It keeps us from putting people into our own tiny boxes. It allows us to create, to innovate, to invent. Every puzzle is full of surprises, reminders that what we thought was true just plain wasn’t. Puzzles are a continual reminder that being wrong is natural, perfectly OK — as long as we are willing to adjust our perspective along the way. Even the process of choosing a puzzle is an adventure all its own. You’re reminded of things you love — things you may have forgotten. You find yourself looking at landscapes and collages and fantastic scenes you’d never have encountered otherwise — whether you decide to take that particular one home with you or not. Then, as you carefully study the box or insert, you notice finer and finer details about the image — things you completely missed the last ten times. A stingray off in the distance. A tiny butterfly hiding in that tree. And what kind of fish is that, anyway? Imagination is ignited. Conversations are changed. And you just can’t help but get that childlike, wide-eyed wonder and excitement as the larger picture takes form in front of your eyes. Part of the yellow coral. Had it not been shipped with the box? Sure enough, after all the pieces had been placed … there was one blatant hole in the masterpiece. I checked the floor thoroughly one more time. Down on hands and knees. Pulling back the edges of the rug. Tilting chairs and lifting table legs. The piece was nowhere to be found. Truth be told, it was a sad moment. In a last-ditch effort, William, who was visiting at the time (and who had spent so much time on the puzzle that he’d been dreaming about it), suggested we check the chairs one final time, just in case the piece had somehow gotten stuck. It was a half-hearted effort at best. I saw something wedged between one of the inset cushions and a back chair leg. I reached in with careful fingertips. And sure enough — there was the missing piece! You’d have thought we’d won the lottery. Talk about learning to live simply. It’s my hope that, in sharing my vacation puzzle adventure, you too might be inspired to take a fresh look at the value a puzzle might bring to your own near future. I love a jigsaw puzzle, and although we don’t have the room to do a really big one in our house, I always do a digital jigsaw online every day when I have lunch. I agree with you about how much you can benefit from ‘puzzling’ and do some of my best thinking when ensconced in the peaceful solitude of a puzzle. Didn’t realize it is where I get my patience and stubborness from! I’m 100% sure the puzzling is contributing to that patience and stubbornness, Jaye. I hadn’t even thought about digital jigsaws (though for me, as with books, while I may enjoy the digital version, I think I’ll always prefer the paper-and-ink variety). 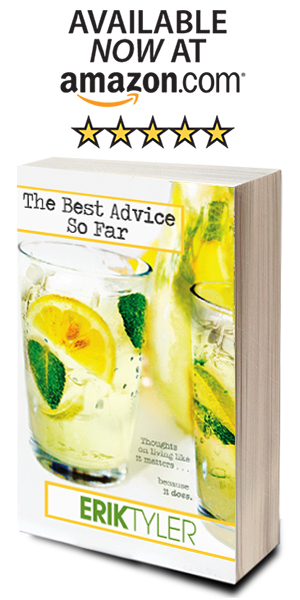 Feel free to share the link to your favorite here, Jaye, since others have expressed interest. Thanks! It’s called ‘Jigsaw Puzzle+ and it’s on http://facebook.com. They have literally hundreds to choose from and it’s free! Love this!!!! 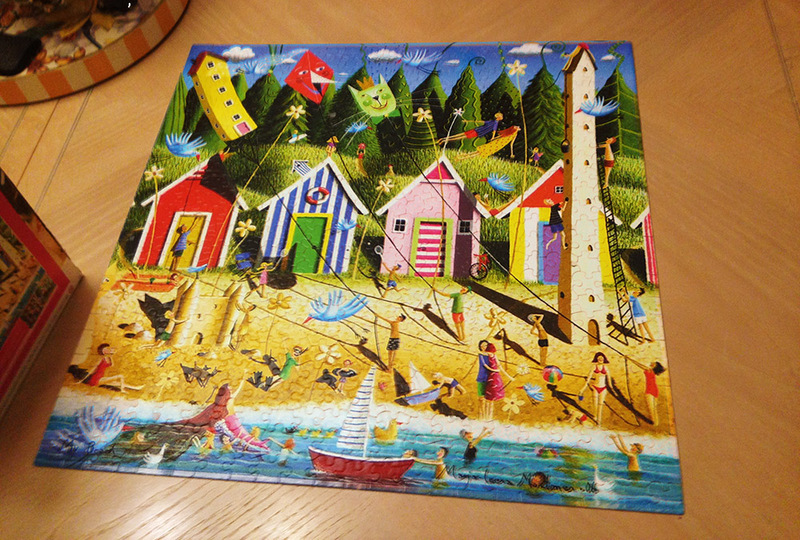 Love puzzles, they are a quiet ( rare these days) enjoyable and challenging treat! Yes, they do have that “leisurely vacation” feel packed right in with them, don’t they? And I find that they allow people to share time together without the pressure of constant chatting, for those who want to engage but aren’t as talkative. Julie, what kind of work do you do, that puzzles are welcome in the work space? I recently returned from a vacation in Tahoe. At the cabin where we’d stayed, my wife found a puzzle and rediscovered her dormant love of the experience. Puzzling does indeed encourage quietude: It’s a solitary, analog activity without the bells and buzzes of, say, an iPhone game. It’s the kind of quality “me time” we don’t partake in enough of these days.